The government is concerned about the damage caused by people who occupy land without consent of the owners. They have opened a consultation in which they mention camps used by Traveller communities. Through the consultation, which closes Friday 15th June 2018, they want to hear your views on existing legal powers that can be used in the case of unlawful camps, and to discuss whether new powers are needed. If the government introduce new criminal penalties for people who occupy land without the consent of the owner, this will potentially have a harsh and unfair effect on Traveller communities. Many other people (for example homeless persons and political activists) could also be impacted by any change in the law. It is really important that the government hear from as many people as possible from all parts of the community. You do NOT need to know in detail about the law to give your views. The government are looking for people’s views on the following issues. You do not need to have an opinion on every part of the consultation. The questions are framed around the idea that camps and occupations are a problem, but you do not have to agree with this to respond to the consultation. What do you know about occupations and camps in your area that happen without consent of the owners? What are your views on the situation in your area? What involvement do the police have when people occupy land without consent? Do you think that the police should have more powers? Do local authorities need more powers to force people to leave land? Should the police have more powers to require people to leave land that they are occupying? Should there be a new criminal offence that can be used where people camp on land without the consent of the owner? How can local authorities make more use of legal orders called injunctions to prevent people occupying land without consent? How can local authorities, police and local communities work together to prevent problems that might be caused by camps and occupations? Could court action to evict occupiers be made to happen more quickly? Should a special quick court process called an Interim Possession Order apply to camps on open land? How can planning controls be used to deal with camps and occupations? Should the government produce new a new policy on camps and occupations? What is stopping local authorities from providing more sites that Travellers can use? What impact might any changes in law and policy have on travelling communities? Do you have any other comments related to camps and occupations? Anyone can let the government know their views via the consultation weblink (https://www.surveymonkey.co.uk/r/NW6G3YD). You do not have to answer every question. You can also email your thoughts to landjusticeuk@gmail.com and we will try to put together a response on behalf of the network. The consultation closes on Friday 15th June 2018. If you would like to be part of the land justice network response, please contact landjusticeuk@gmail.com before Friday 25th May 2018. In London, tenancies are short, disrepair is common, and rents are higher than almost anywhere in the world. 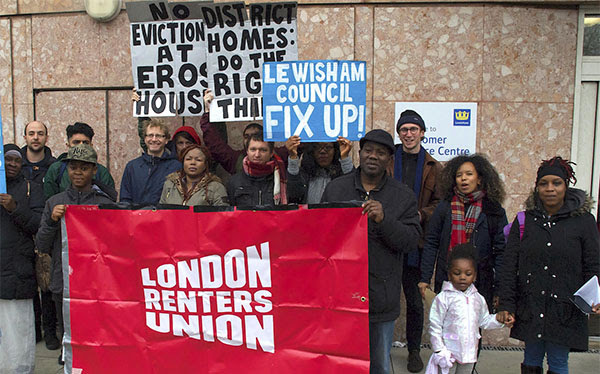 After just a few weeks of organising, London Renters Union members at Eros House flats in Catford took action to demand an end to evictions and for urgent safety and disrepair issues to be solved. The steadfast residents of Eros House in Catford took action to demand an end to unsafe conditions and evictions in their homes. They delivered a letter, with lots of energy to Lewisham Council and one of the management companies that runs the tower block they live in. They were supported by LRU members and activists from Newham and across our city. They’ve struggled with electrical hazards, serious damp and mould and faulty heating for too long – and some residents are facing eviction by the private company they rent from. London Renters Union was set by a coalition including Radical Housing Network, Take Back The City, Generation Rent, Digs (Hackney Renters), and People’s Empowerment Alliance for Custom House (PEACH). They’re currently building their first pilot branch in Newham and hope to have branches across the city by the end of 2018. The Tweet to retweet is at https://twitter.com/LDNRentersUnion/status/984081149050916864 . The Facebook post to share is at https://www.facebook.com/LondonRentersUnion/posts/434286730327689 .